Sulfurous Acid is a chemical compound which has a formula H2SO3, and is a weak and unstable acid, formed when sulfur dioxide dissolves in water. 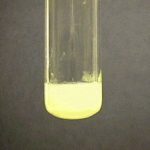 The facts that sulfur dioxide actually exists in solution, cannot be said surely, but the molecules of this substance has been detected in the gas phase. It is a reducing, as well as a bleaching agent. The sulfurous acid compound is only formed in the aqueous solution, and is therefore not isolated in its pure state. The sulfurous acid structure is as follows. It shows the bond between sulfur, carbon and oxygen. The chemical formula of Sulfurous Acid is H2SO3. This is the Sulfurous Acid Chemical formula, since it atoms of hydrogen, oxygen and carbon are joined by a strong chemical bond. This is also the molecular formula for sulfurous acid, since it demonstrates that one molecule of sulfurous acid contains two atoms of hydrogen, one atom of sulfur and three atoms of oxygen. Sulfurous acid is also known as sulfur dioxide solution. It is not an organic acid. It is a clear and colorless solution. In the normal physical state, Sulfurous acid is a colorless liquid. It is appreciably soluble in water, and ignites automatically at a particular temperature. It is a generally stable acid, and is not compatible with strong bases. The boiling point of sulfurous acid is -60 °C or 213 k.
Sulfurous acid has a sort of sulfurous odor. Its vapor pressure is 1740 kPa at about 21 °C. The formula weight of this acid is 82.07 amu (atomic mass units). The Density of sulfurous acid is 1.03 g/cm3, or 1.03 X 103 kg/m3. The acidity of sulfurous acid is 1.5 on the pH scale. It is not a very weak acid, but not a strong acid as well. Sulfurous acid is a weak and dibasic acid, and it corresponds to the +4 oxidation state of sulfur. This acid id known to form only in the dilute aqueous solutions, and does not occur in other state. When this acid is exposed to atmosphere, it is transformed to the strong sulfuric acid. This acid is basically formed due to the incomplete disassociation of strong sulfuric acid in the aqueous solution. Sulfurous acid is a very strong reducing agent. It also acts as a bleaching agent since it has some bleaching properties. There are certain substances that are injured by chlorine. These substances are bleached when they are exposed to sulfurous acid. This acid generally does not exist independently, except for aqueous solutions. Therefore it is not harmful in normal circumstances, since it does not exist independently. But it is converted to sulfuric acid on exposure to atmosphere, and this acid had many harmful effects. This sulfuric acid combines with rain to form the harmful acid rain. Acid rain is not only harmful for life, but for plants as well.